School can be a horror story. It is a space where identity is controlled and regulated and where normalcy and conformity rein. Anyone who doesn’t belong is firmly aware that they are the school’s monster and those who enforce that normalcy treat those who don’t belong monstrously. In “Show and Tell”, Kate Story’s narrator was punished constantly as a child for daydreaming and was treated regularly as a social outsider. She was subjected to gendered expectations for women about “attractiveness”, having her facial features policed and told that certain facial features were unattractive and therefore inappropriate. When Story’s narrator has to return to her school as an adult before the building is demolished, she collides with her own identity and the multiplicity of options her life could have taken. She finds her old school cubby hole still intact with her old Saucy Doll shoved away at the back of the cubby. The doll has the capacity to shift through different expressions as her arm is pumped and as the narrator takes the doll through the different facial features, she sees a world of different possibilities, underlying the different masks that people wear at different times of their lives. The Saucy Doll underscores the idea of roads not taken, possibilities missed, and opportunities taken differently by the narrator – the different worlds that she could have inhabited if she had made different choices. Story’s use of the multi-faced Saucy doll underscores the social perception of childhood as a time of multiple potentials, a world open to possibilities and choices and the idea of adulthood as an experience of choices already taken and options limited. “Show and Tell” is a narrative about memory and the discovery of different aspects of selfhood. In the multiple faces of the doll, we can see the multiple masks that we, ourselves, wear throughout our lives, shifting expressions to express different aspects of ourselves. Story plays with the notion of the uncanny valley, the idea that as something approaches looking human it looks cute until it gets too close to human appearance and then it causes discomfort. In this case, the Saucy Doll embodies ideas of attractiveness and prescriptive femininity, attempting to shape the way that women are allowed to BE in this world. The Saucy Doll and its presence in the school embodies ideas of memory, trauma, and the passage of time. The narrator finds herself mimicking the expressions of her doll, shaped by her doll, illustrating the way that dolls shape the identities of young girls and the expectations about how they are able to present themselves in the world. Dolls are normally things that mirror us as we project on them, instead she is mirroring her doll and being projected upon by the doll. To find out more about the work of Kate Story, visit her website at http://www.katestory.com . In this episode of Speculating Canada on Trent Radio, I interrogate the work of Max Turner, an author who explores the notion of the psychiatric institution through the perspective of a vampire. Turner sets his vampiric character in a former psychiatric institution in Peterborough Ontario called the Nicholls’ Ward. In this discussion of Max Turner’s work, I explore ideas of aging, coming-of-age narratives, expectations of young adult fiction, vampirism, assumptions about psychiatric institutions, and general ideas of home and belonging. 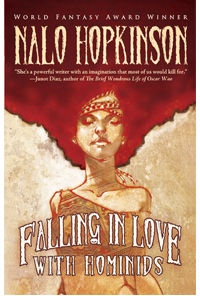 Falling in Love with Hominids illustrates Nalo Hopkinson’s playfulness with language, her characteristic exploration of the way that language shapes social interactions and develops plot. Hopkinson illustrates her fascination with ideas of sound and the power of mis-hearings, exploring stories that came from her own mis-hearings of things and the point of speculation that occurs when one tries to determine what was actually said. In stories like The Easthound which came from a mis-hearing of “The Eastbound”, Hopkinson examines what an Easthound would be and how this notion can create a figure of terror. In “The Smile on the Face”, she examines the relationship between names and identities, creating a character named Gilla who discovers a resonance to the reptilian (coming from the association with her name) and a connection to mythic stories about other reptiles. Hopkinson plays with characters who question the way they are written, examining figures (for example) from Shakespearian plays such as Caliban from The Tempest and allowing them a place to resist the texts that have been written about them and providing a space for them to push their own meanings through the text. In Shift, she explores the way that racialised assumptions have been cast onto Caliban and his desire to escape from the narrative that has shaped his life. Hopkinson enters into shared-world creations and disrupts the idea of a very white, Euro-centric fairy world in the Bordertown series by creating figures who challenge this focus on the European magical world by creating characters who come from non-European mythologies. In “Ours Is The Prettiest”, she asserts the multi-ethnic nature of characters, playing with previous reader assumptions about character ethnicity and examining the intersection of ethnicities and cultural identities. Hopkinson illustrates her ability to represent the under-represented, bringing attention to those areas that are cast in the shadows of most mainstream ideas of science fiction. She brings attention to those characters who are largely left off from mainstream SF, populating her worlds with characters from an array of sexual and gender identities, challenging the white-centric worlds created by most SF authors, and inserting those presences that are Othered in so many SF narratives. Falling in Love with Hominids is a text of transitions, examining those times when change is at its peak. She examines transitions between adulthood and youth, portraying the idea that adulthood is not always in a protective role over youth and can, in fact, be damaging to youth because of the excesses of power adults wield over the young. She plays with the transition between life and death, exploring notions of life after death and the way that we tend to be haunted by memory and guilt. Hopkinson casts the light of speculation onto those ideas that are cast into shadow in everyday reality, those areas that can be seen best by the outsider, the oppressed, the erased. Falling in Love with Hominids represents a text of examining the human experience, an act of recovery of those aspects of humanity that are suppressed or repressed and a re-invigoration at the sense of wonder about human experience. I am excited to be able to talk about a book that deals with Peterborough, the town that I have come to call home. Max Turner’s Night Runner takes place in the Nicholls’ Ward in Peterborough, the city’s former psychiatric facility. The Nicholls’ Ward closed in 2010 due to issues of cost for repairs and updating of equipment and spaces and it was moved over into the main Peterborough Regional Health Centre building. Throughout the building’s history, it was at various times used as offices for the hospital, archives, a nursing residence, a meeting space, and a library. It was only in its final years that the building was switched to primarily a psychiatric facility. Max Turner’s Night Runner takes a novel approach to the teen vampire story by setting the vampire initially in a psychiatric facility. Zach Thomson grew up in the Nicholls Ward after his parents died when he was young. Night Runner takes place when Zach is 15 years old. His experience of youth hasn’t been the same as that of other kids – which is not surprising because children rarely grow up in psychiatric facilities. But his experience is different from that of other children for a variety of health related reasons outside of his mental health. He has an allergy to sunlight, he has a limited diet and is allergic to most foods, and he has bouts of anger and silences that can last for days. Zach has been recognized by his nurses as being in need of specilized medical care. Growing up in a psychiatric ward, Zach has never considered himself normal and he isn’t even certain what ‘normal’ for a teen should be. Max Turner creates a novel that questions ideas of normalcy and appropriateness by disrupting ideas of what can be considered normal. He challenges the behaviour of society in ostracizing certain people because of their difference. By situating Zach in a psychiatric institution, Turner questions ideas of family and the type of people that can make up family, extending the idea of belonging to a wider group of very different individuals. Night Runner, like many Young Adult tales, is a story about self discovery and the idea of developing a purpose. Zach believes that his life so far has been one of uncertainty and a lack of purpose because he has been in a psychiatric facility all of his life uncertain about what is “wrong” with him and waiting for a cure for his various allergies. Turner explores vampirisim as a blood-based pathogen, an infection, but one that radically changes the body, and one that can be spread through the bite. It is also an infection that generally comes with an end date – as every vampire eventually experiences Endpoint Psychosis, a psychiatric illness as they reach the end of their lives and therefore radically change. It is appropriate that a story that deals with the idea of Endpoint Psychosis begins in a psychiatric institution where the same issues of determining “capacity”, self control, and selfhood are diagnostic features both for the psychiatric nurses and for the vampire council who kills vampires they see as being dangerously out of control due to Endpoint Psychosis. In both areas it is up to others in positions of power to determine mental health and ability. Night Runner, like vampirism itself, is about radical change, coping with different social and emotional pressures and the process of discovery.